Happy holidays from your orginio team! It’s that time of the year again and as we are taking a look back on the past months we hope that orginio was of great use to you in 2018 when creating your org charts! Maybe our cloud solution helped you share details on the org hierarchy with your colleagues? Did you integrate it into your company’s intranet portal? Or, were you able to visualize additional relations such as succession within the org chart via dotted line? Whatever the scenario, in order to keep working with orginio easy and straightforward, we’ve published some articles this year in the orginio blog that target various possible application scenarios. To further optimize the orginio user experience, we introduced a design update this year. It’s modern and fresh, and allows you to present more information in the org chart, e.g. additional details of a selected object. Thanks to new display rules, objects can now either be blanked out or highlighted via color coding. If you haven’t tried these rules out, you should. This way, it’s so much easier to focus on the information relevant to you! But before you dive back into org charting with orginio, we would like to wish you happy holidays and a healthy, prosperous new year! https://www.orginio.com/wp-content/uploads/sites/3/2018/12/orginio_Christmas_2018_880x220px_150dpi.jpg 220 880 Jennifer Utley /wp-content/uploads/sites/2/2016/02/logo-orginio-300x138.png Jennifer Utley2018-12-18 11:10:152018-12-18 11:10:15Happy holidays from your orginio team! Are you looking for a certain org unit or position, or do you need to know where to find a colleague? orginio offers several ways to quickly get to the desired spot within your org chart. One possibility is to move through your org chart with the help of orginio’s level navigation. Simply click onto the arrows below the org chart boxes to open the next hierarchy level. orginio also comes with a hierarchy tree from version advance ATTRACTIVE onwards, providing another, more compressed view of an organization’s complete command structure right next to the org chart view. Each org level can be opened or closed via the arrow symbol. By clicking on an object within the tree, you are navigated to the respective box within the org chart. Is it easier for you to find what you are looking for with an overview in front of you? In that case, just click the button “Zoom to fit” and your org chart will be fit to your screen size. 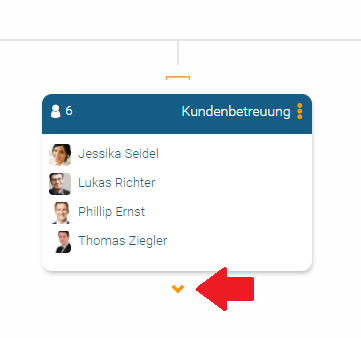 Last but not least, orginio’s search function allows you to get directly to the desired entry point in your org chart. Type the name of the respective person, position or org unit into the entry field and select the right hit from the drop-down list. In our blog article „The benefits of orginio“ we already pointed out how an org chart can be beneficial to different groups of people within an organization. But first, it needs to be made available to them. So, in case you have just finalized or updated your org chart, here are some ways to share it with your colleagues. In order to reach as many co-workers as possible, you can publish your organogram on your company’s intranet. All you need is the access key, a public link, which you integrate into the portal. The access key comes with the great advantage that existing access rules are in effect. Find a more detailed description on how to generate the access key and publish your orginio in the article “Integrate your org chart into your intranet portal”. The entry link – read more about it on the favorite features page – is not only helpful if you’d like to bookmark a certain point of the hierarchy structure to come back to if needed. The entry link can also be shared with co-workers to inform about or discuss a certain view of the org chart. Make sure that your colleagues are logged in before using the link as access rules apply. Printing org charts from orginio is really easy. Click the print button in the settings bar to receive either a PDF or an image file (your choice!) of the displayed boxes. In this case, what you see is what you get. We as humans are inherently visual. About 83% of what humans perceive is based on sight1 with the other 17% broken down among the other senses. As a logical consequence, we believe that the visualization of HR data (or any data in general) is an essential tool for identifying the information that is important to you when sifting through the data jungle! So, let’s explore some different ways you can create visual representations – with your org chart! One of the most obvious visualizations for org charts is the hierarchy structure. Being able to see an entire organization from top to bottom in a visual way makes it easy for anyone viewing the chart to understand relationships and reporting structures quickly. An org chart can show details like pictures of employees, team structures within groups, and other data, or it can be a simple hierarchy tree that allows for viewers to easily drill down into departments and command structures. Integrating KPIs directly into your org chart gives HR and managers quick access to important information about teams and departments, facilitating the process of HR controlling. For example, if your organization is looking to grow a department’s head count by the end of the year, showing the head count KPI right on the chart makes it easier to see how close you are to reaching your goal at a glance rather than drilling down into the department and manually counting the roles. Or, how about visualizing each department’s budget spent to see at a glance if they are still on track? The visualization of big data can be incredibly beneficial. Rather than working with spreadsheets and documents full of numbers and text, creating a visual representation of your organization’s data can make it easier and faster for consumption of the information at a glance. Employee demographics such as gender or age, location and head count are just a handful of data sets that can be visually represented. A thought to keep in mind: The larger your organization, the more data you most likely have available. However, just because you have data available doesn’t mean you need to visualize all of it! Focus on making your complex or extensive data visual. If a visualization of the data doesn’t help in time-to-comprehension, it probably isn’t necessary. Relationships on an org chart can be different from a standard hierarchical structure. Visualizing relationships that are cross-departmental, project-based, or otherwise outside of an employee’s regular reporting structure helps HR and managers see all areas of the organization that an employee touches. For instance, you can create separate groups for these relationships (e.g., project or agile teams which we’ll go further into below) or show the relationship through dotted lines. Read more about the visualization of organizational relationships in this Ingentis HR gimmick. Special skills can often be overlooked as an important part of org charts. Adding skills to your organogram can help HR or managers quickly find employees who fit certain descriptions or have a non-role-related skill without having to send out to company-wide communications asking for the information. Since agile teams are dynamic-based on which roles are needed for projects at a certain time, visualizing how they fit into your organization can be incredibly beneficial. There are a few ways you can visualize your agile team within your overall org chart. For example, try color coding employees who are part of a team, creating completely separate groups for the agile team. Or giving iconographic indicators to these employees so that when you look at the organization as a whole, you can delineate which employees are currently working on an agile project. We recently wrote a blog post about how you can visualize agile team structures which you can check out to dive even deeper into the topic. 1.See for example Florack, Scarabis, Primosch (2012, p. 325), or Braem (2004, p.192). Org charts by orginio are versatile HR tools that each employee of an organization can benefit from. The whole team at a glance, thanks to orginio. The overview orginio provides to executives is clear and rich in content – and it’s available anytime and anywhere. Need to draw some information about a team member or contact them? Or, would you like to have a closer look into resources? It’s all possible in your orginio org chart. Access protection allows you to limit the availability of confidential data to certain people. With orginio, the creation of org charts is easy to handle. If the necessary data is already saved in an Excel file, all you have to do is upload it to orginio! Of course, you can start from scratch and develop your hierarchy structure step-by-step. Additional information about an employee (e.g. skills) can be added at any time. Dotted lines show relationships between employees, e.g. mentor- or deputyships, or successors. Org chart branding is also possible with orginio: Give your org chart the right look by adjusting it to your corporate design or selecting one of the designs already available with the application. Changes to a company’s structure can happen anytime. Reorganize your org chart within seconds via drag & drop. The visualization of important KPIs turns org charts into a powerful strategic tool for executives and HR managers. Be it head count, span of control or other key figures – it takes just the push of a button to display them within the org chart. orginio provides everybody with a clear, reliable overview of the company hierarchy, including contact information. The integrated search functionality helps when looking for further data. Especially new colleagues profit from the possibility of retrieving information about other team members, their contact details and responsibilities. The org charts are printable and exportable. Are you interested in learning more about orginio? Check out the org charting tool’s most favorite features here. orginio, Ingentis’ org charting and workforce planning solution for the cloud, has now been added to the Okta Application Network (OAN). Okta, leading single sing-on (SSO) provider in North America, is known for being the “foundation for secure connections between people and technology”. Its OAN platform offers SSO access to currently more than 5.000 pre-integrated applications while complying with highest security standards. The integration of orginio is attended by the SAML authentication standard, an open-standard, XML-based data format for verification processes. orginio offers five different licensing packages featuring various functionalities. The proceed PERFECT package comes with single sign-on.